In 2003, a funny thing happened. My parents were visiting Atlanta, where I was attending law school, and they were staying at a nice hotel in Buckhead. They asked me to meet them there for a drink and, as often happened when I’d sit with my parents in a hotel lobby sipping a gin and tonic, they pointed out a piano and asked me to play it. The lobby was pretty quiet so I shrugged and sat down and knocked out a few tunes. After all, I used to play the piano professionally (I was the pianist at the Boca Raton Hotel & Resort Sunday brunch buffet). A few songs in, an elegantly dressed woman walked over and asked me to play the theme from “Somewhere in Time.” Weirdly, I happened to know that song because my dad played it on the piano too. So I started playing, she said “thank you” and left a $20 on the piano. Before I could stop her, my mom walked over to a table where the elegantly dressed woman was sitting with an elegantly dressed man. They started talking and my mom eventually waved me over. And so it was that in the summer of 2003, I moved to L.A.
For those who’ve been following me for the past 7 1/2 years, you know the law thing didn’t work out. 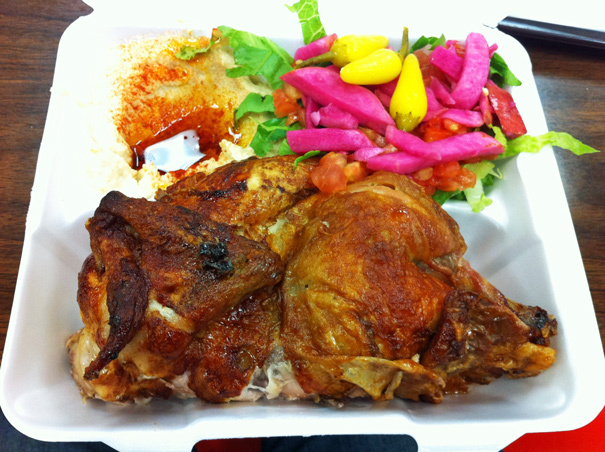 But while here in L.A., I bought Calvin Trillin’s book “Feeding A Yen” which led me to Jonathan Gold’s book “Counter Intelligence” which led me—yes, this will all make sense now–to Zankou Chicken. On Sunset Blvd., in a dingy shopping center with a geriatric security guard who asked if Craig and I were brothers, sits Zankou Chicken. 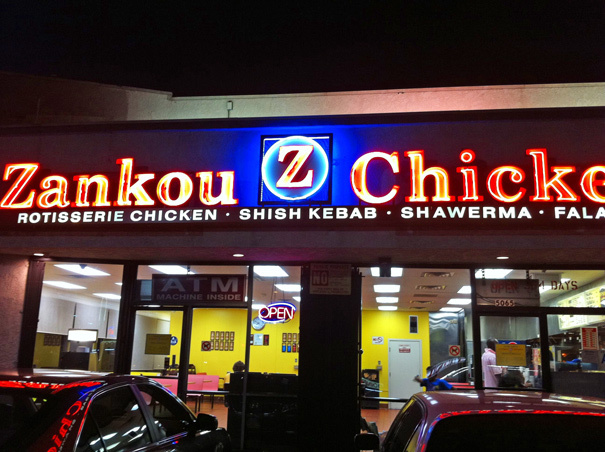 Sure, there are other Zankou Chickens (it’s become something of a chain), but this is the one that I first visited 8 years ago. 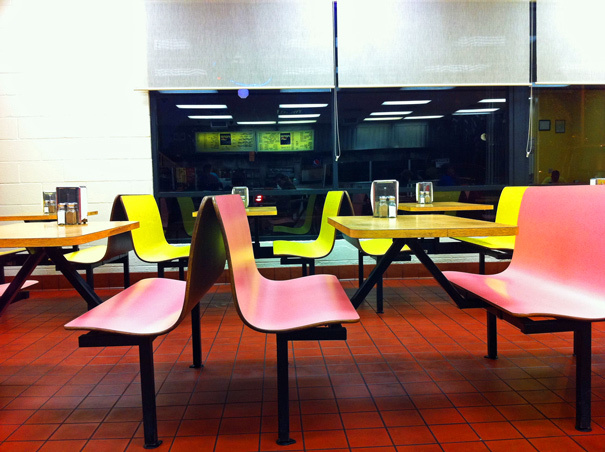 But you don’t go to Zankou Chicken for the scenery. You go for the chicken. And as you can see by the lead photo, that’s some extraordinary chicken! It gets cooked on a rotisserie which, in my experience, can normally dry out chicken–usually because it sits on the rotisserie way longer than it needs to until someone orders it. But the chickens at Zankou are marvelously moist. And the bronzed skin is sweet and crisp and addictive. I had to make myself stop eating it because (a) it was just so good and (b) there was just so much of it. This sauce is a great gastronomical mystery. 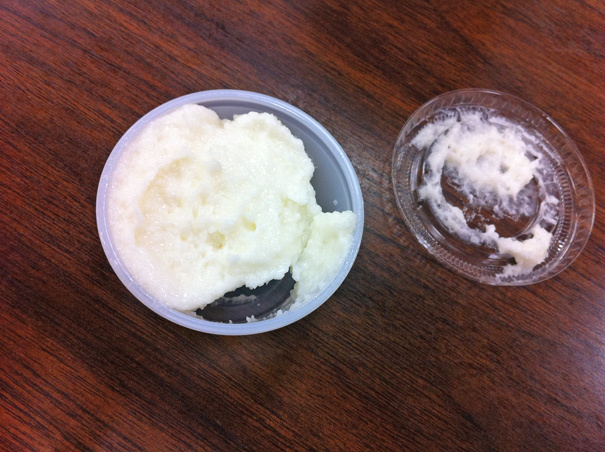 It tastes of raw garlic and yet is somehow white and fluffy. Is it an aioli? No it is not. Is it a mayonnaise? Nope, it’s not that either. Best of all, the chicken is still as good today as it was when I first experienced in 2003. If it weren’t for a piano, the theme from “Somewhere in Time” and a $20 bill, it would’ve taken me a lot longer to get here.